n 2013 Goldie completes a remarkable 20 years as a recording artist. To celebrate this impressive milestone, Metalheadz and the iconic ‘ffrr’ dance label are coming together to release Goldie’s first ever career-spanning retrospective entitled “The Alchemist: The Best Of Goldie 1992-2012”. Released on March 11th, on triple-disc CD and digital download, this definitive collection reads like a Drum & Bass almanac. It was a move to London and a visit to the Rage Club in 1991 that changed everything for the talented graffiti artist from the West Midlands. DJ Fabio and Grooverider were playing that night and gave Goldie his first taste of Jungle. That night a fledgling career in music was born and the rest, as they say, is history. Inspired by what he heard, Goldie went on to write the incredible and hauntingly dark ‘Terminator’, a track that became a massive hit on the burgeoning underground Jungle scene. Two decades on and this album becomes the first retrospective of Goldie’s long and illustrious career. It is a collection that takes us on a veritable 20 year journey through the Drum & Bass scene, from the epic opening track, ‘Malice In Wonderland’ through to the truly extraordinary ‘Timeless’. And there’s a brand new track to savour as well. The sublime “Single Petal Of A Rose”, the first new Goldie track of 2013 is exclusive to this collection and a must-hear for fans everywhere. Disc 3 of the album compiles together the best of Goldie’s mixes for other artists including his sublime interpretation of Bjork’s Isobel’s and Garbage’s ‘Milk’. Other artists’ interpretations of Goldie’s own tracks are also included including the stonking Armand Van Helden remix of ‘Digital’ and the ethereal beauty of the Baby Boy Edit of ‘Inner City Life’. In short this collection is a stunning testament to Goldie’s position as the undisputed ‘Godfather’ of Drum & Bass. 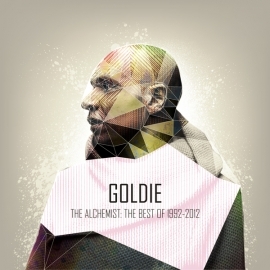 The Best Of Goldie is released on Triple Disc and Digital Download on March 11th 2013.